These Vestil laminated style dock bumpers provide durable, economical protection for your loading dock and trailers. 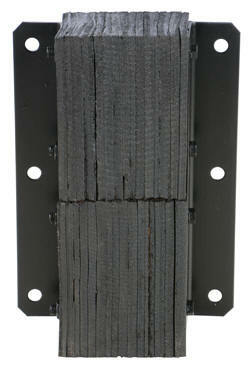 Units are constructed of fabric reinforced rubber from recycled truck tires. The models listed here all come in 11" widths, 4.5" and 6" projection (depth). All are available in 20", 24", 30", and 36" heights. The pads are laminated between painted structural angles and held together with 3/4" steel tie rods. Installation is quick and easy by bolting or welding units to the dock. Mounting hardware is not included. Width in description refers to bolt hole center to bolt hole center (not the overall width-see link to pdf in specs in the chart for more details). Bolt holes are 7/8" diameter.